Benjamin Franklin once said that a penny saved is a penny earned. Save the right penny, though, and it's worth more. Take a look on eBay (EBAY) and you'll find hundreds of listings for auctions selling pennies. Yet despite the huge number of coin collectors who use the auction site to buy and sell collector-grade coins, most of the auctions you'll find aren't about quality. Instead, an increasing number of people are trading dull, well-worn 30-year-old pennies by the pound. The reason? Their metal content happens to be worth more than their face value. Over the years, inflation has hit the penny hard. As Motley Fool contributor Rich Smith noted earlier this year, it costs the U.S. Mint about two-and-a-half cents to produce each penny, even as it has steadily degraded the metal content of each coin. Currently, pennies are 97.5% zinc and 2.5% copper, and at current prices of those metals, each new penny has a theoretical "melt value" -- what you'd get if you melted down pennies and sold the zinc and copper -- of about half a cent. But throughout most of their history, pennies were made up of 95% copper, with the remaining 5% being either zinc or tin. As a result, with only a few wartime exceptions, any penny from 1981 or earlier -- and some made in 1982 -- have a high copper content. At current copper prices, the melt value of older pennies is well over two cents. Melt values are theoretical because actually melting down pennies is illegal. But just as coin collectors did with quarters and dimes after 1964, when the coins went from being 90% silver to a copper-nickel blend, some intrepid entrepreneurs have now started bagging up old pennies and selling them as unofficial copper bullion. Currently, auctions are asking between $2 and $3 per pound for quantities of 10 to 25 pounds of coins. One auction featured 100,000 pennies -- weighing about 680 pounds -- that sold for $1,500 plus $125 in shipping charges. That's less than the melt value of more than $2,000, but a nice profit for those who kept their penny jars around. 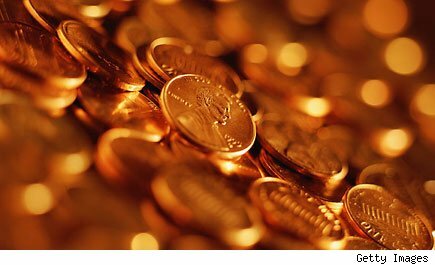 Earlier this year, Canada finally decided to call it quits with its penny, citing manufacturing costs. The U.S. has been surprisingly resistant to giving up the penny, though, with new designs having come out in just the past few years. With current budget issues forcing the government to look for cost-cutting measures, though, the penny could be one of the casualties -- and the rush to save them could get even stronger. Motley Fool contributor Dan Caplinger had fun going through pennies with his daughter over the weekend. He doesn't own shares of the stocks mentioned in this article. Motley Fool newsletter services recommend eBay.